purposes of this book is to demystify this process. communication is natural, relatively simple and a wonderful growth experience. a form of spiritual empowerment. 1. Develop our intuition and other psychic abilities. 2. Increase our ability to love ourselves and others. 3. Become more aware of the workings of the universe. facilitate our own spiritual evolution. 5. Protect us from negative entities and/or other forces in the universe. 6. Access the wisdom of the ancients. 8. Overcome bad habits and fears. 9. Eliminate the fear of death. 10. See into the future. 11. Master the art of out-of-body experiences. 12. Learn our true karmic purpose. 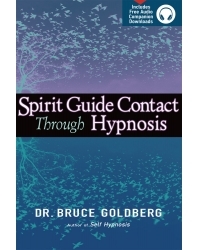 And as a bonus, Spirit Guide Contact Through Hypnosis includes free audio companion downloads! including Oprah, Regis, CBS News, CNN, Art Bell, and many others.